Very little was wasted in 19th century Britain. Clothes were handed down to younger brothers and sisters, waste food was given to the poor or used as animal feed and broken furniture was often used as firewood. 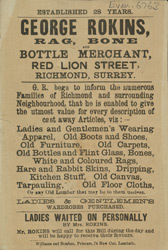 Rag and bone men, like George Roskins would travel through the streets of cities and towns, usually on a horse drawn cart, collecting any recyclable materials. He would then sort through it and recover rags to be made into paper, bones to be sent to the bone china factories and bottles to be reused by the factories.